McLaren today revealed its much-anticipated new Formula 1 car. The striking MCL33 will contest the 2018 FIA Formula 1 World Championship, and marks the first time in McLaren’s 52-year history that it has run a car powered by Renault engines. Over the past week, McLaren’s social media posts have featured orange in some way. Shortly before the teaser trailer was released, McLaren shared a video of the car it took to the 1974 Indy 500, decked out in 'papaya', with its designer Gordon Coppuck. Though last year's car saw the team move back towards an orange colour, it was not the 'papaya' orange associated most with the early days of Bruce McLaren's team and also featured large chunks of black across the chassis. Powered by new engine partner Renault, McLaren is prepping for a change of fortune this season. The next step however will call for the MCL33's validation on the race track, with the team projecting 500km of running per day at the Circuit de Catalunya in the next two weeks. “If we’re able to develop the key strengths of last year’s chassis and marry it to an improved Renault power unit, then I think we’ll be able to take a step forwards. The car certainly looks very neat and well thought-out, and I think the new colour looks really great; really eye-catching. “The arrival of a new car is always one of the most tense and exciting moments of the season. 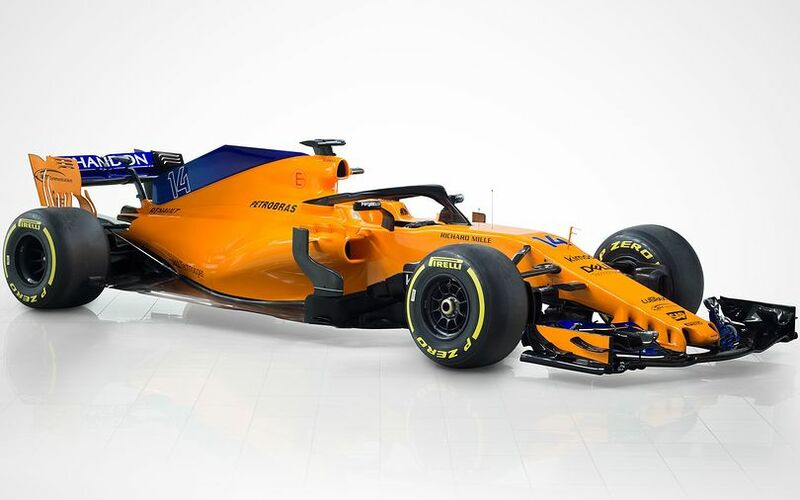 For everyone at McLaren, this is an important car; we all know exactly how much rests on it being successful, and we’re all extremely keen to see just how well it performs when we start testing it next week. “From my perspective, I really hope we can start the season with a stable platform that we’re able to develop quickly and easily. It would be great to have a smooth few weeks of winter testing, and to go to Australia feeling confident about the year ahead. “I’ve been training hard all winter and feel as ready as I can be to get back into the cockpit. I’m fit and focused, but I’m also relaxed, because I think we’ve had a very productive winter and have designed a very capable new car. “The MCL33 represents a fresh chapter for McLaren – one that clearly embraces our evocative history while also serving to guide our future. We may have faced a tricky last few years, but this team has demonstrated time and time again that it emerges stronger from each and every challenge. “And, for 2018, it’s not merely the colour of the car that marks the change: there’s a determination and commitment that exists within everyone who works at McLaren, and we’re fighting stronger than ever to return to the front. “I also want to acknowledge the loyal support of our long-standing partners including Chandon, NTT Communications, Hilton, Richard Mille, Norton Rose Fulbright, SAP and all our official partners and suppliers. “It’s imperative that McLaren looks to re-establish itself on the track this year. “Off-track, we have been working as strongly as ever: this year’s car is the result of a fantastic amount of teamwork and effort, of which we can be hugely proud. As ever, this formidable team keeps pushing itself forward, and I applaud everyone at McLaren for their relentless commitment to the mission. “It’s fantastic to be able to return McLaren’s grand prix cars to the classic papaya orange livery they once sported in the 1960s. They look incredible, and really underline the fearless spirit with which we attack the new season. “I think the whole team feels proud of this car. “The design, engineering and aerodynamic departments have done an incredible job delivering a new car with a new power unit in an extremely short timeframe. We never took the easy route or looked to shortcut a process or a solution; and the result is a car that is neat and well-resolved. “That said, we are under no illusions that it will be difficult to splinter the hegemony at the front; and that the midfield will be full of well-funded, experienced outfits with plenty to prove. We are humble about the challenge ahead, but feel we’ve prepared well, have a solid package that we can build upon and exploit as the season progresses, and have two excellent drivers who will make the difference in races.